Not sure I would go for the pro version of a Teensy 3.6 especially with the Teensy 4.0 in the pipeline. This me as a hobbyist speaking. When the pinout/layout of the T4.0 are finalized will be interesting on the breakout boards that come out for T4.0. Another updated schematic is attached and routes have been traced. Also attached is a render of the updated board design. Includes: the MK66FX1M0, the MKL02 programmer, the 16MHz and 32.768 kHz crystals, and a push-button for programming. Minor update since v1.0-rc2: some pin changes were made to help with routing. Major update since v1.0-rc2: The board grew to 33 x 34 mm. The sizing is completely driven by ensuring enough clearance between the USB and MK66FX1M0. I actually ended up with a little extra room on top in one corner of the board, so I ended up using the MKL02 programmer on the top surface instead of the MKL04 programmer on the bottom. This means that I will likely include the MKL02 with every board instead of it being optional. Some comments: This is as small of a board as I can make with the LQFP package of the MK66FX1M0. It is a compromise. From a business use standpoint, I would love to use the BGA package, hirose connectors, and drop the programmer and USB port to get the smallest board possible. But that would be expensive - mostly because low volume production with 4+ layer boards is a big step up in price compared to 2 and 4 layer boards. It would also require stencils and a reflow oven for any daughterboard designs. From a hobbyist standpoint, I love having a USB and the programmer on board and would like 0.1" pin spacing for a breadboard. But of course that would be huge - this thing has 120 I/O pins! So this board is a compromise; it includes the USB and programmer, uses a lower cost manufacturing process, and includes headers that are hand solderable while keeping the footprint as small as possible for embedding in products. I'm sure I could design a two layer daughterboard to fan out the pins to 0.1" pitch single row for a breadboard. I might just do that and share on OshPark since that since it seems like a great idea. Slightly updated, a new render is below and a new schematic attached. Minor update since v1.0-rc3: Added USB0 +/- to the through hole headers as well as VREGIN_0. VREGIN_0 is the other half of the muxed power regulator on the MK66FX1M0; this is nominally coming from USB0 power, but if an external USB is used via the USB0 +/- signals on the through hole header, then VREGIN_0 can be brought in from an external source as well. To facilitate the addition, 3 of the 4 through hole headers were increased to 32 pin headers instead of 30 pin. I also made sure each header had a VDD pin in addition to VSS. Additionally, I bumped the headers slightly so that they are all on a 0.05" grid to facilitate using 0.05" (1.27 mm) pitch protoboard. The size increased slightly, so the board is now 34.5 x 34.5 mm. Congrats! Looks like a nice project for those who need many I/O and peripheral pins and who do not aim for 1/10" breadboard compatibility. I don't see this in concurrence to the T4.0 which will most probably win a price with much more Mips, speed in general, and 64bit floats, but which will, at least in the first version, have to go through the 24pin bottleneck, while this board would even allow 32bit parallel I/O. As much as I like this approach especially for prototyping custom teensy projects which needs more pins: Do the changes since the initial idea in the first post, i.e. getting rid of the expensive extra hardware, not lead to a more or less direct Teensy 3.6 competitor? I guess I see them as complementary, and I hope PJRC does as well, you have the Teensy 3.6 that's low cost, small, and perfect for breadboard prototyping. Then this for projects where you need the additional I/O, are willing to spend more, and give up the breadboard compatibility. Well, you're possibly right. I'm curious about further progress! There is a PJRC published reference board on OSH Park with BOM - linked from PJRC.com - it relies on the PJRC MKL02 bootloader. Buying that from PJRC is some compensation for using the design. With that Bootloader MCU from PJRC as part of the design of this unit it does the same. Putting Teensy in (or near?) the name is likely a trademark issue. I've not seen any post, on or paperwork that may come with, the MKL02 bootloader that may or may not allow product attribution of the inclusion of the 'PJRC bootloader' in some fashion? ** not a lawyer - just an avid follower of the work PJRC presents. Brian: Is there SD or Flash space on the bottom side at this point? And are those USB Host parts/pads on the PCB? Yeah, I'll need to come up with a better name to avoid confusion. There is nothing on the bottom at this point. Interesting idea to add SD. Flash would be nice, but it's expensive! The USB host pads are not on board; however, the pins are available on the header - USB1 +/- and VBUS. Flash: Only the pads like the audioshield. SD: I hope without levelshifters? (you announced them for an other board). Hahaha, thanks! Yes, I saw that and forgot to reply. I went back over the design and realized my mistake. No level shifters will be on the production version. As far as host USB - wasn't sure what the open large pads were - looking again that would be by what must be the LDO and not the USB part PJRC has on the T_3.6? The board is getting interesting Brian. There is only one thing that I see that may be a challenge. No mounting holes? Don't think there is enough edge room to slide it into a case or anything as a work around. The SOT-323 looking thing is a dual diode for VBAT, this design is using the MK66FX1M0 built in voltage regulator. The bare pads next to it are the 32.768 kHz crystal for the RTC; I don't have a 3D model of the crystal made, so it's not getting rendered. 6. I measured 3.2V at the output of the diode leading to VBat, so I think VBat is getting power and this also probably means that the MK66FX1M0 internal regulator is working (this board does not use an external regulator, rather relies on the MK66FX1M0 internal regulator to drop the 5V USB to 3.3V). That's it for now. More debugging later. An arduino I picked up on Kickstarter didn't have mounting holes for pins, just small notches along the edge for easy surface mount onto a larger board, or possibly to solder on thin wires. I like to put LEDs and stuff inside 28mm scale miniatures (about 1:56, but called 28mm because that's the distance from the 'ground' to eyeheight of a typical male human in that scale), and I generally only have the space under the base to put any electronics and batteries, so I always take note of 'compact' tech. Did your get the hardware debugged? I have done a similar design a bit more focused on an specific application but have not reduced to hardware yet. Though I'd take advantage of your excellent work! Thanks! Not yet. I've had limited time to debug it and my current scope is pretty terrible. I may manufacture one soon with a slightly different crystal, see if that fixes the issues. As soon as you have a working prototype batch I will definitely order a few for trial. I dug into this more this morning. If I apply regulated 3.3V power to VIN, the board works. 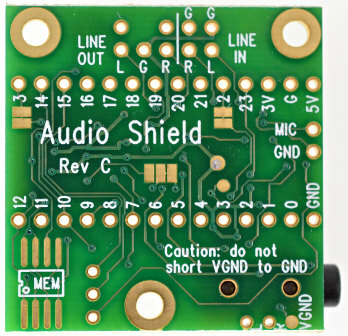 This board was designed to rely on the internal regulator in the MK66 microcontroller; however, the Teensy 3.6 does not use this feature. So I wonder if some extra configuration is needed in the startup code. Might be easier to just add a small regulator to the board. Super easy software fix - just needed to initialize the internal regulator during startup. I'll get a modified core library available shortly. Last edited by brtaylor; 02-14-2019 at 07:25 PM. Hello Brian, any updates? Did you run a first test batch? Congratulations for this interesting project!